I hope you guys had a great weekend though I was working on this weekend. This post has been in my drafts for a long time but was not getting time to complete it. But today I am here with the Specifix Skin Brightening Facial Kit Review. I first discovered this facial Kit through an online blog a couple months ago. I had been struggling to get my old glow back. My daily unhealthy routine and the summer sun in Delhi completely destroyed my complexion, while also causing breakout and pimples on my face. My hands and neck were covered with tan lines which discouraged me from wearing cut selves and off shoulders which are the essential parts of summer fashion. I used this VLCC kit regularly 2 times by now and as claimed was not so impressed by the results. Unlike other brightening products, this facial kit claims to delivers instant fairness. Though I can see little difference on my skin but that not so evident. After use I feel my skin soft and supple than before. But it fails to work on the function of an idea facial kit. I still have that tan and dead skin flaunting even using the kit twice. Though, a temporary glow was definitely there after the facial. 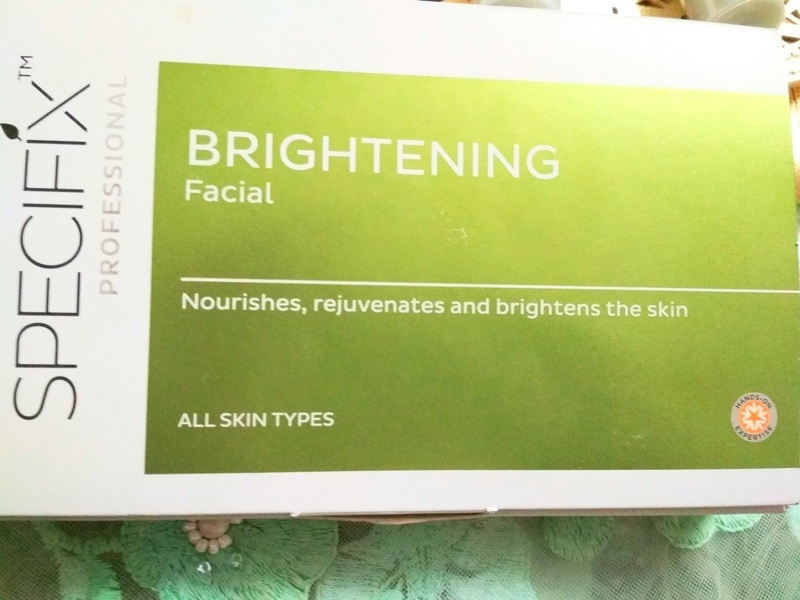 Specifix Brightening Skin Facial Kit comprises of natural extract, and essential vitamin extracts that helps in cellular regeneration, while enhancing skin brightness, to give you a clear, fresh glow. The facial is formalized synergistically, which promotes skin elasticity, to provide a balance soft, radiant, nourished skin. This kit comes with 4 tubes that will deliver you a parlor like an experience, anywhere you use it. You can use it before a special occasion or regularly. The dirt and pollution in the air today can damage the quality of your skin, promoting acne and signs of early aging on your face. It is essential that we take proper care of our skin, and prevent it from becoming a skin problem. It comprises of everything from cleanser to nourishing cream to facial backs, so you don’t need to spend extra money for buying them separately. The first time I used this kit, I was amazed by how stubbly it’s brightening cleanser, removes all your blackheads, without feeling rough on your skin. Unlike other scrubs in the market, this is made from natural fruit extracts of papaya and aloe-vera that gently cleanse your pore and dead skin off your skin without comprising with the texture of your skin. However, it does leave skin a little dry, which might not be great news for people with dry skin type. This can be used as a daily brightening cream that will help you fight all the signs of dullness. This cream enhances your complexion by going deep in your pores and removes dead skin cells, while also promoting regeneration of fair glowing skin. The third step in this kit comprises of a brightening pack, which can help prevent wrinkles and other signs of early aging from developing on your skin. Just apply the pack for 10 to 15 minutes, and you will be able to achieve a fresh radiant glow. The natural ingredient in this pack makes this an appropriate choice for all skin types. This solution helps to ensures to provide longevity to the new found glow after all these three steps on your skin. This serum also helps in hydrating your skin while delivering a fresh glow. Apply this gel for 10 minutes and all the dullness on your skin will be replaced by a fresh radiant glow. You can use this get separately before any occasion to get the instant fairness within few minutes. You can also use this gel as a massage and gently move your fingers on your cheeks, with gentle pressure. People with sensitive skin might feel a little irritation while using this product, so make sure to test it before applying it directly to your face. I will give this product 2.5 out of 5 stars. This is a great product for people who want instant brightness. However, it does leave your skin a little tight and dry which might not a suitable choice be for people with dry skin. If you have also used this Specifix Professional Brightening Facial Kit do share your thoughts in the comment section. I shall be back with my next post soon, till then take care. Never heard of this brand before, sounds interesting! I ave dry skin so would not be a good fit for me, I guess. That was a great review. I was planning to buy it but thought of reading it's review first.It helped me.